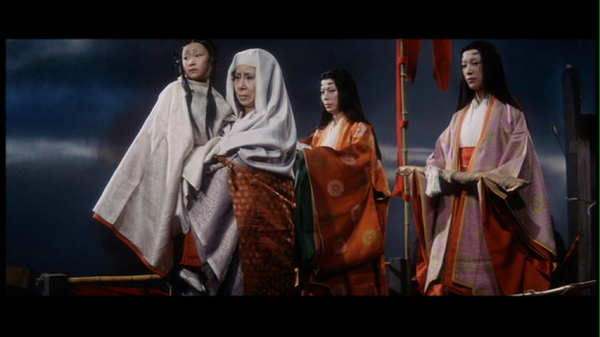 Kaidan (1964), known in the US as Kwaidan - is a dazzling experience for lovers of visual cinema. Directed by Masaki Kobayashi , this film does not have the plot intricacies of Akira Kurosawa's Ran (1985) , nor the masterful performances of the likes of Toshiro Mifune or Isuzu Yamada's terrifying take on Lady Macbeth in Kumonosu-jou (1957, aka Throne of Blood). There are no wire-fu Samurai duels here, (there is an highly stylised, epic sea battle though), no fast paced camera tracking or horseback warrior prowess. These tales unfold in a way that allows the images to do all the talking. Those that do watch Kwaidan and bemoan the pace or dialogue are really missing the point in a spectacular way. It is best to treat this movie like a visit to an art gallery (and music performance). Of course, there is some dialogue and commentary to give the images deeper context.Whilst not as warmly received in Japan itself during the mid 1960s, this film has gone on to become a cultural treasure for Japanese and international cinema. The centrepiece of this film is the tale of Hoichi the Earless. Hoichi is a blind Buddhist Monk, who has the gift of music, including playing the biwa. One of his pieces is the tale of a great sea battle. This is not a fictional battle, but actually refers to the battle at Dan-No-Ura which occurred on April 25th, 1185 CE. This battle occurred toward the final phase of the Genpei War. Unfortunately for him - Hoichi's performance of the song is so moving that it has the power to summon the spirits of those who perished in the battle. The focus of the tragedy of this famous conflict was the death of six year old Emperor Antoku. Indeed, the retinue of spectres that haunt Hoichi in the film are still bound to the spirit of their young Emperor. The battle sequence was filmed in a large pool. Drapery and painted murals provide richly coloured backdrops as Hoichi recounts the battle. You do not have to be a student of Japanese History to feel the sense of tragedy that accompanied this event - the haunting recitation by Hoichi and Kobayashi's amazing visuals do this for you. The style used by Kobayashi used no battle sound effects or dialogue, merely sequences illustrating the words and music of the tale. I also loved the tale of the woodsman and the Goddess who fell in love with him. A young Tatsuya Nadaki (sp?) was delicious and the scenes between him and the Goddess, who bears him children, were gentle and tender - making the final ending more painful. Thanks for the comment Nancy! 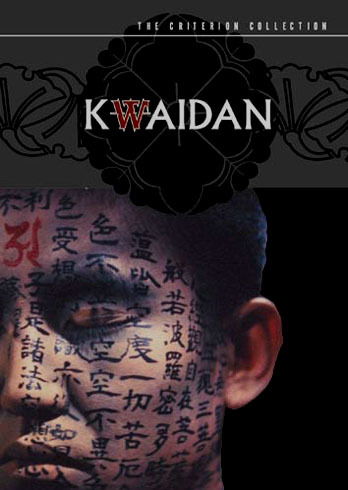 All of the stories featured in Kwaidan have a special charm. I really love teh cheeky grin the ghost in the teacup gives in the very first story.